Katie Torn holds an MFA from the School of the Art Institute of Chicago, and was a 2014 Fellow at Eyebeam Center for Art and Technology in New York. Currently she is faculty in the Department of Digital Arts at Pratt Institute. 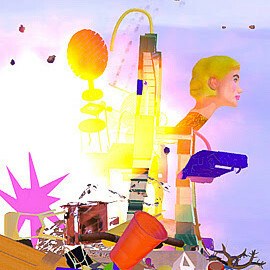 Katie builds fantastical virtual totems using the detritus of consumerist culture. Assembling the color, texture and whimsy of early modernist painting, Katie crafts hyperreal fairytale spaces and experimental video works, often using the tools commonly employed in Hollywood films and commercials. Currently Katie’s work is on view in the group exhibition Les Oracles, curated by Marisa Olson at XPO Gallery in Paris, Fance. Past exhibitions and screenings of her work have included the Museum of Contemporary Art, Los Angeles; Postmasters Gallery, New York; Bitforms Gallery, New York; and Interstate Projects, Brooklyn.